To my credit I had listened to Wildewoman before I saw the cover and couldn't help to have some suggestive ideas pop up in my head. And in Doe Maar colours as well. 'Skunk' forever! And if you do not live in The Netherlands you best look up the album on Spotify. Reading the Wikipedia entry of the Wildewoman, it's not so strange that I had these ideas pop up, the band had the same connotation it seems. The cover is a painting by Belgian painter Evelyne Axell from 1964 by the way. Wildewoman is a band from Brooklyn fronted by singers Jess Wolfe and Holly Laessig who also play keyboards. They are backed by two guitarists, Peter Lalish and Andrew Burri and a drummer called Dan Molad. Next to them there is a whole host of guest musicians and background vocalists assisting Lucius in making a wonderfully crafted and sounding album. This is the band's first full length album after releasing an EP in 2012. The music of Lucius starts and ends with the voices of Wolfe and Laessig. Clear sounding and weaving. It is a joy to listen to them sing. Their way of singing lends the album a poppy atmosphere that the music does not necessarily provide in each song. The music is a mix of pop, indie rock and occasionally more complex, rhythm driven songs. There's also a nod to the new folk side of music. 'Two of us on the run' could have been a The Lumineers song e.g.. 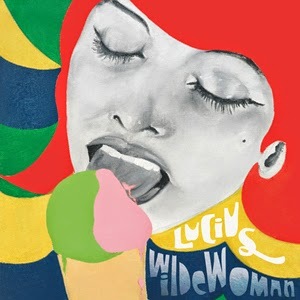 The blend of songs is successful as most songs are fascinating and simply draw me into the world Lucius provides. How diverse Wildewoman is, becomes clear when I listen to a song with an extremely dreamy quality like 'Don't just sit there', with a great electric guitar part in it. This certainly is one of my favourite songs on the album. And although Wildewoman is a modern sounding album, the singing takes me back about 50 years, to The Shangri-Lahs or The Ronettes. At the same time Warpaint isn't extremely far away either. With a lot in between as well, like the French duo Brigitte e.g.. This makes Wildewoman as much a feast of recognitions as it is a new and fresh record, very 2014. It is this combination that underscores that Lucius has made a special record, with it's own characteristics. Wolfe and Laessig know how to make the best come out of their harmonising. Although both their voices tend to go upwards, they manage to separate themselves in all the right places, creating heavenly melodies. They draw most of the attention on Wildewoman which is not totally fair to all the other things played on the album, but is the consequence of the extreme front position of the vocals on this album. This way Lucius may not have recorded a perfect debut album, but certainly one of the best first records that I came across in 2014. You can listen to 'Tempest' here. Heel lang heb ik getwijfeld of ik deze plaat stiekem voor mezelf zou houden of niet. Primal Rumble van Gretchen Lohse is al weken een persoonlijke favoriet waar anderen geen weet van hebben. Een plaat die ik stiekem koester als één van de grote verassingen van de laatste tijd, maar waarover ik tot dusver nog geen letter heb opgeschreven. Vandaag maak ik een einde aan het voor mezelf houden van het debuut van de singer-songwriter uit Philadelphia. Allereerst omdat Primal Rumble van Gretchen Lohse veel meer aandacht verdient dan de plaat tot dusver krijgt en hiernaast omdat het voor jezelf houden van een mooie plaat uiteindelijk toch minder voldoening geeft dan het delen van deze plaat. Gretchen Lohse komt zoals gezegd uit Philadelphia en heeft met Primal Rumble een fascinerende en als je het mij vraagt bloedmooie plaat gemaakt. Op Primal Rumble domineren uiterst ingetogen folksongs. Het zijn folksongs met een hoofdrol voor een subtiel bespeelde akoestische gitaar en de mooie heldere stem van Gretchen Lohse. Tot zover onderscheidt Primal Rumble zich nog niet van de talloze andere platen in dit genre, maar Gretchen Lohse heeft nog een aantal sterke wapens achter de hand. Dat zijn allereerst haar bijzondere songs. Het zijn zeker geen songs die je na één keer horen meezingt, maar desondanks ligt het lekker in het gehoor en prikkelt het ook nog eens de fantasie. Primal Rumble valt hiernaast op door een bijzondere instrumentatie. De akoestische gitaar van Gretchen Lohse staat centraal in vrijwel alle songs op de plaat, maar hiernaast zijn er strijkers, blazers en authentiek klinkende synths (van Thomas Hughes van The Spinto Band), die het debuut van Gretchen Lohse een geheel eigen en vaak wat sprookjesachtig geluid geven, dat ze zelf omschrijft als 'chamber folk'. Er zijn ongetwijfeld mensen die niet goed uit de voeten kunnen met de bijzondere, soms wat pastorale, stem van Gretchen Lohse en de zoete inkleuring van de meeste van haar songs, maar persoonlijk vind ik het prachtig. Primal Rumble is een plaat die verleidt en betovert, maar ondertussen maakt Gretchen Lohse ook een plaat die zorgt voor een aangenaam loom gevoel en een verlangen naar lente en zomer. Primal Rumble klinkt als een zwoel lentebriesjes, fluitende vogeltjes, een lekker zonnetje en een zorgeloze dag, maar ook als een onverwachte regenbui op een mooie zomerdag. Ik ben al weken diep onder de indruk van deze plaat en denk dat er meer muziekliefhebbers als een blok gaan vallen voor deze mooie en bijzondere plaat. Gretchen Lohse maakt op Primal Rumble muziek van een bijna buitenaardse schoonheid; de afbeelding op de cover is wat dat betreft veelzeggend. 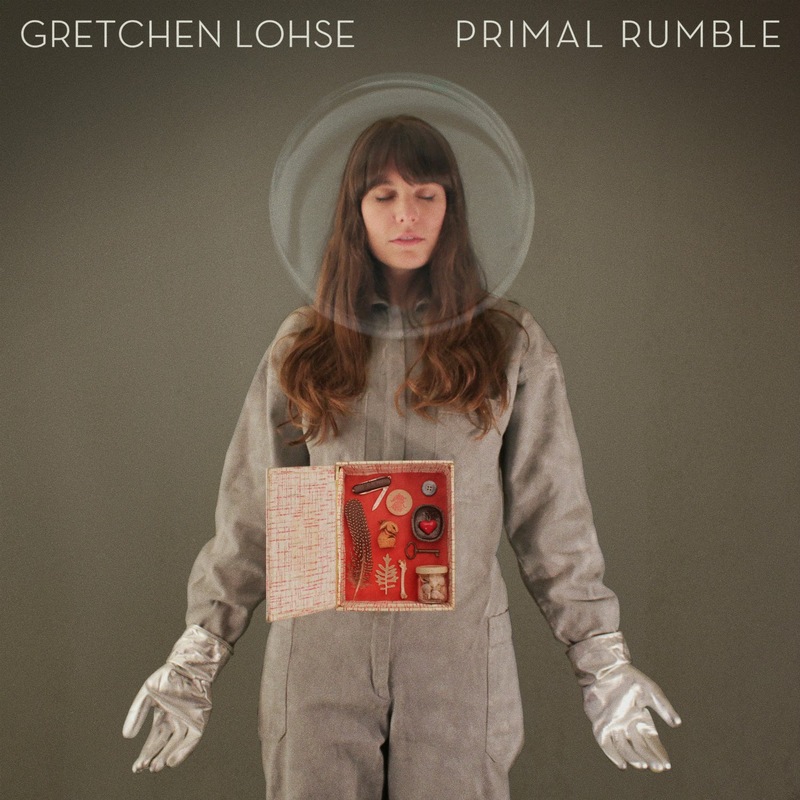 Primal Rumble van Gretchen Lohse ligt niet in Nederland in de winkel, maar kan worden verkregen via haar bandcamp pagina (http://gretchenlohse.bandcamp.com/album/primal-rumble). He's back, the chocolate dark brown voice of, Sivert Høyem, with a new solo album, Endless love. I have to admit that I seem to have missed one or two. Solo albums are nothing new to Høyem. He released one or two in the lifetime of Madrugada. It was only after the death of guitarist Robert Burås that he had to make a career out of going solo. Madrugada became one of my favourite bands in the 00s. From 'Industrial silence' onwards I followed the band, including some great EPs, until that oddly black cd sleeve, that made me wonder what was going on and read that small message at the back. Unbelieve and shock for something that had happened months before. Sivert Høyem was the voice of Madrugada, a giant portion of its unique sound. The other parts were the otherwordly guitar sounds of Robert Burås. The final part was the mystery surrounding Madrugada's music. The emptiness and prolonged silences. So where does Høyem go with Endless love? The title song gives a clear answer: a little Madrugada with layers of guitar, without the subtlety I was used to. Sivert Høyem does not just want to copy his old band. That graces him on the one hand but on the other there is this layer of magic missing in his music. The question is: does that lack sit in the way of me enjoying this album? The answer to this questions begins with the fact that I truly enjoy hearing his voice again in new songs. His dark voice with the slight Norwegian accent won me over in 2000 (I think) and that never changed. It's just that I didn't really care for his solo albums so far. Listening to Endless love for several times that seems to have changed. The opening songs are really, really strong. The songs have the mystery that go with Sivert Høyem's voice. There may be a little less echo put on his voice, which makes the song just this little more worldly, the mystery is there. In music and lyrics "You want to know about endless love. Endless will break your heart". The last "heart" in the song sung like a sound between a sigh and a loud whisper. Like the final breath leaving someone dying. The more I listen to Endless love, the more I realise how much I'm starting to like the album. That this may be the album that I was waiting for, but had given up on or just forgot about that I needed it badly. Many sounds are familiar, new elements added. There is more emphasis on keyboards, which makes Endless love varied and attractive to listen to. 'Handsome survivor' is a The Rolling Stones 'Exile on Main Street' worthy ballad. With great female voiced harmonies in the back ground. 'Inner vision' works perfectly in between 'Handsome survivor' and 'Free as a bird/Chained to the sky', which I love so much more. The lightness of this ballad is just excellent, the acoustic guitars making it sound very open. Together with 'Little angel' the three songs form classic Sivert Høyem ballads. The last one foreboding. Three ballads that could not be further apart in texture and mood. If there is something that residents of other countries may not appreciate, it is how big Sivert Høyem is in his home country Norway. His last three albums all reached the #1 position there. Compared to 0 here in The Netherlands. None even charted. To be honest, Endless lover should chart here soon also, as this album deserves it. Fans of e.g. Blaudzun and Moss ought to enjoy this music a lot. The album sort of peters out in the last songs, if I'm honest. Endless love is not the perfect album like 'Industrial silence' and 'Grid' are. It could have used two more up tempo songs and one or two less ballads. Next to that it doesn't have an über song like 'A dead end mind' or 'Electric'. Endless love does have 'Wat Tyler' on it, a song that is whipped relentlessly onwards, with all weird guitar noises that bubble on top of the rodeoride rhythm. 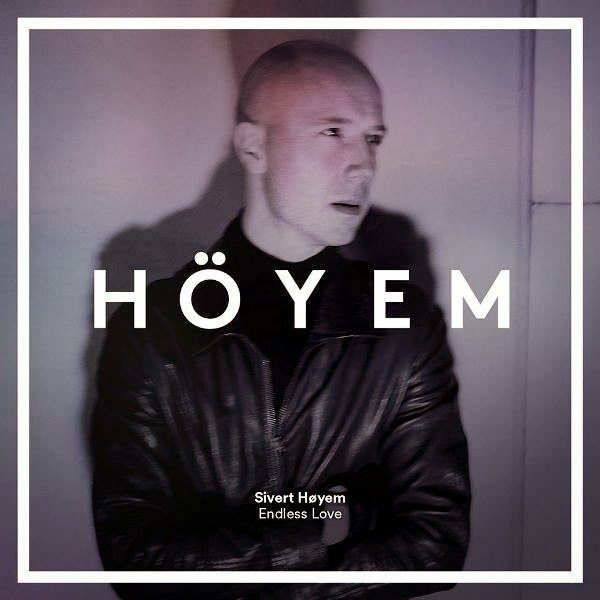 There is an awful lot to enjoy on Endless love and as far as I'm aware -I missed an album here- Sivert Høyem is back on track with this album. An album that has its own moments of magic in abundance. Welcome back, Mr. Høyem! You can listen to 'Inner vision' here. De vorige plaat van The Robert Cray Band, het in de zomer van 2012 verschenen Nothin But Love, ontdekte ik pas na bijna anderhalf jaar. Dit keer ben ik er gelukkig weer wat sneller bij, want het in een bijzonder fraaie hoes gestoken In My Soul verscheen een paar dagen geleden. Bij beluisteringen van opener You Move Me weet je direct dat het weer goed zit. Robert Cray debuteerde in 1980 en heeft inmiddels een uit duizenden herkenbaar geluid, waarin zijn geweldige bluesy gitaarspel en zijn soulvolle vocalen een belangrijke rol spelen. Toch is In My Soul geen herhaling van zetten. Dat hoor je eigenlijk in bijna alle tracks die volgen, waaronder de cover van het van Otis Redding bekende Nobody’s Fault But Mine, waarin Cray de blues tijdens de tweede track op de plaat tijdelijk verruild voor pure soul en laat horen dat hij niet alleen als gitarist maar ook als zanger op een bijzonder hoog niveau opereert. In My Soul bevat meer tracks waarin invloeden uit de soul belangrijker zijn dan invloeden uit de blues en dat bevalt me wel. Ook wanneer Robert Cray zijn gitaarlijnen wat subtieler inkleurt, maakt hij diepe indruk met snarenwerk waarvan de meeste muzikanten alleen maar kunnen dromen. Waar voorganger Nothin But Love af en toe verzoop in een productie waarin de strijkers wel erg zwaar werden aangezet, is In My Soul een opvallend pure plaat zonder al te veel opsmuk. Het is een plaat waarop liefhebbers van de stem en het gitaarspel van Robert Cray ruimschoots aan hun trekken komen, maar ook een ieder die geen liefhebber is van de bluesy muziek van Robert Cray, zal onder de indruk zijn van de mooie soulvolle klanken op de nieuwe plaat van de muzikant uit Columbus, Georgia. In My Soul is een gedreven klinkende plaat waarop Cray zich niet heeft laten verleiden tot een maken van muziek met hitpotentie. Het tempo ligt op In My Soul wat lager dan we van Robert Cray gewend zijn en in een aantal songs mag Cray net wat langer door jammen, wat spectaculair gitaarwerk oplevert. Maar ook in de wat kortere songs met een ondersteunende rol van fraaie blazers, maakt Cray een gepassioneerde indruk en maakt hij muziek die geen compromissen heeft gesloten. Ik heb inmiddels een flink rijtje Robert Cray platen in huis, maar Cray klonk wat mij betreft nog niet vaak zo puur als op In My Soul. 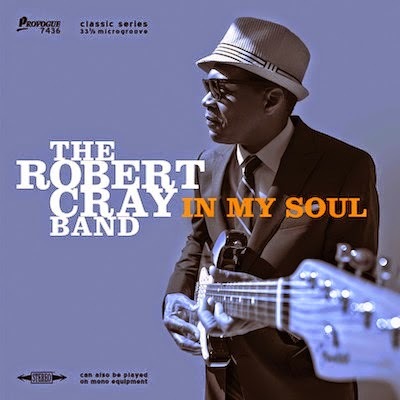 Natuurlijk helpt het lenteweer van het moment wat mee, maar ook als het twintig graden zou vriezen zou In My Soul van The Robert Cray Band zorgen voor zomerse temperaturen. Robert Cray heeft als succesvol bluesmuzikant de schijn wat tegen (idioot natuurlijk, maar het is niet anders) en hoeft daarom bij de critici niet te rekenen op heel veel krediet, maar wat hij op In My Soul laat horen is van grote klasse. Ik was eind vorig jaar met enige vertraging zeer onder de indruk van Nothin But Love, maar In My Soul is als je het mij vraagt nog een stuk beter. Robert Cray heeft een heerlijke plaat gemaakt voor late avonden en vroege ochtenden, maar ook in de tussenliggende perioden kan ik deze plaat uitstekend verdragen. In My Soul is de zoveelste kroon op het indrukwekkende werk van Robert Cray. Je kunt hier naar 'Deep in my soul' luisteren. As promised recently I would look into some of the albums I found on Noisetrade.com where I tend to trade my time, attention and views for the music on offer there. 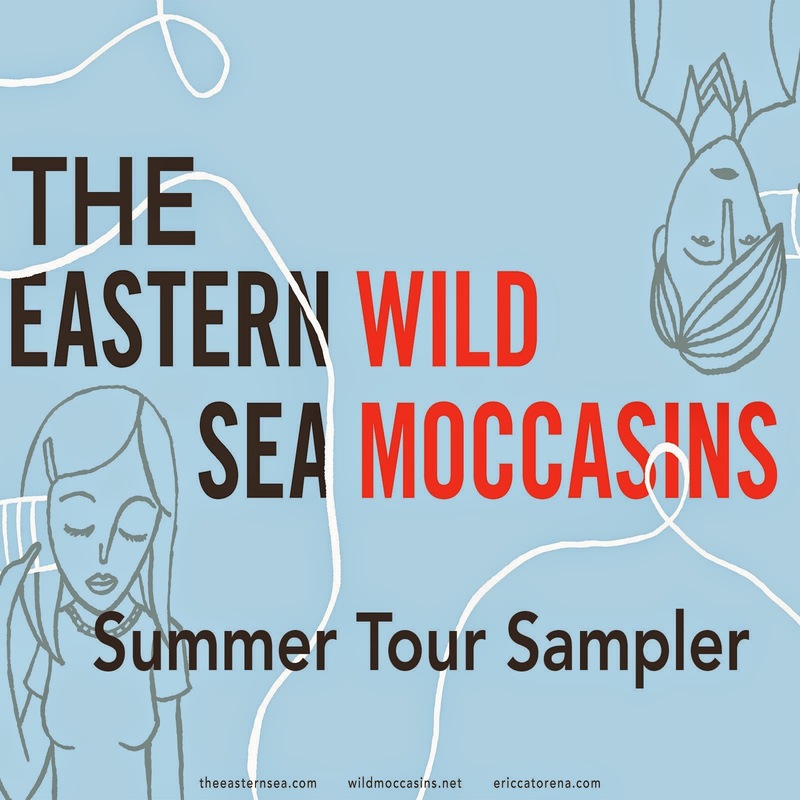 This time it is to review an EP shared by two bands, The Eastern Sea and Wild Moccasins. For clearance sake I will split the review in two. As a whole the EP has an impact, but it seems best to look at the two acts separately..
Wild Moccasins opens Summer tour sampler. The softly muted guitar intro sparks memories of many bands of yesteryear. Deacon Blue, Maxïmo Park, even U2. U.K. British/Irish influences. This reference sticks to 'Skin collision past' as a whole. The male/female singing just sounds familiar and utterly good. The way the vocals are alternated, even to the basic sounds of hey, ho, hey, ho, sound deliciously pleasing. Wild Moccasins is from Houston in Texas and in no way reminds me of acts usually coming from Texas. There is no hint of country, blues, polka and what have you in the music of Zahira Gutierrez (Vocals/Keyboards), Cody Swann (Guitar/Vocals), Andrew Lee (Guitar), Nicholas Cody (Bass), John Baldwin (Drums). Instead it is all Britpop and what went on before that. As said Deacon Blue, but also Texas, Fairground Attraction, the sort of pop coming out of, well, mostly Glasgow from the second half of the 80s. And then there is this little extra. Like the best of Britpop bands Wild Moccasins adds this delicate pop feel in the vocal melodies. To this potent mix the best the U.S. has to offer since Phil Spector is added. The singing of Zahira Gutierrez has this trace of innocence, combined with a deeper sense of longing in it. Not unlike Spector's female singing heroes. This addition makes Wild Moccasins very attractive to listen to. Musically Wild Moccasins is extremely upbeat. Light sounding guitars paint soundscapes of a lighter or slightly heavier variety. The drummer, John Baldwin, has an outstanding speciality. He uses drumrolls a lot, even to accentuate the rhythm and not just to drive a certain part of a song forward. That gives Wild Moccasins something of its own sound. There is an album out, the debut album of the band: 88 92. Chances are more will follow on this blog in the near future. The Eastern Sea holds all the even songs in the line up of this EP. The contrast between the music of the two bands on this EP are quite big. The Eastern Sea holds back a lot more and builds up a song, using dynamics more. Opening song 'The match' fits into the folk rock scene a lot more also, with a whole sequence of percussion only behind the vocal. This makes The Eastern Sea a lot less poppy. Instead it forces the listener to be alert, as a lot is going on. Although it is not instantly tickling the pop strings in my brain. Something is tickled though. 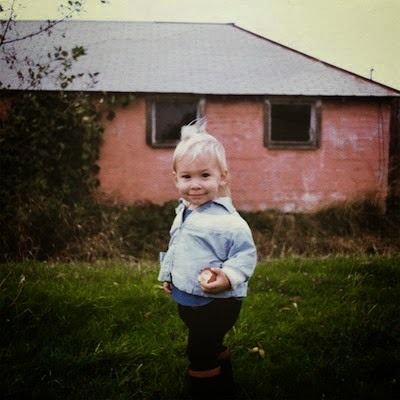 The Eastern Sea is also from Texas, Austin to be more precise and started as a bedroom project of singer Matthew Hines. Through the years a band formed around Hines, although my impression is that it is more a vehicle for Hines' needs than a real band, judging from the long list of ex-members. Perhaps that has changed through the years, I don't know. The band released two full albums in 2011 and 2012 as well as a Christmas album in 2012. All missed by me. The songs on this sampler show a band that is more introspective that extrovert. The music reminds me of some songs of Lauren Mann and Morgan Mecaskey, two acts I also found through Noisetrade. More familiar names are The Decembrists of which The Eastern Sea is a modest version. 'Wasn't for love' introduces a horn section to the music, which works extremely well in this hunted, driving song. It is in those moments that The Eastern Sea starts giving away some of its inner secrets. Because the contrast with Wild Moccasins' exuberance is so great, there are a lot of fine, fine details that tend to get lost. 'A lie', the last song on the EP, is another example of an undercooled but great song that falls away behind 'Born blond'. Again these dynamics and surprising changes in the background of the song. As listener I never know what will happen next. By that time The Eastern Sea has won me over also. As I said, something was tickled. My attention and fantasy. Summer tour sampler is a strange combination of songs by two very different bands, that both excel in their music. Although the former may excel in U.K. (Glasgow) 80s pop and the latter with some pushing and shoving can be filed in the recent folk rock movement, both show their best. My tip is though to split their contributions and listen separately to really enjoy the best of both. That is when their best comes out. DeWolff featured on this blog before. First with the well appraised album 'DeWolff IV' and secondly with a review of a blistering live show in LVC Leiden. 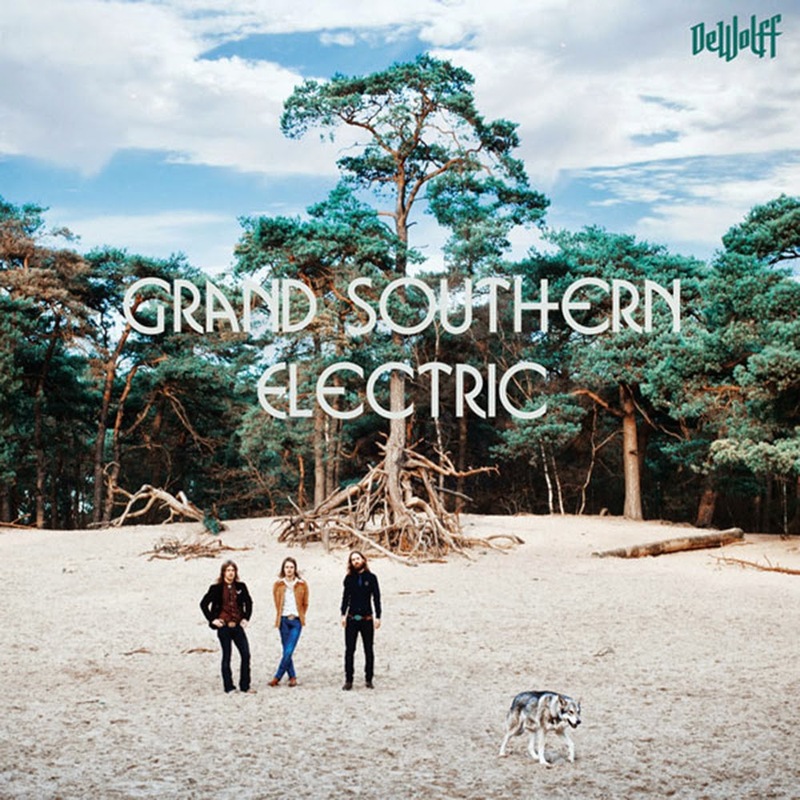 Now the band from the southern parts of The Netherlands is back with a new studio effort called Grand southern electric. As much a reference to the band itself as to the place on this globe where DeWolff recorded its new studio album: Valdosta in the southern state of Georgia. Together with Mark Neill, who in the past worked with The Black Keys, the band recorded its new record. Evidence shows that this decision turned out to be an extremely good one. De Wolff is around since 2007 when the band started in Geleen, a town under the smoke of chemical giant DSM and in former coal country. The brothers Pablo and Luka van der Poel and Robin Piso make the band and form an unusual line up: guitar-drum-organ. Pablo van der Poel sings as well. The music is of days from way back when. Cream, Deep Purple, Jimi Hendrix Experience, anything that infuses power rock with a dose of psychedelia. A little more modern The Black Crowed come to mind. And perhaps because of its venture into the deep south there are a few elements of southern rock in Grand southern electric as well. If anything Grand southern electric is more focussed. The attention is more on the song. Primarily it's about the song. What does it need to shine and become special? As an effect the songs are better than on 'DeWolff IV'. Either that or the bandmembers have become better songwriters. That's another option of course. It is very easy to instantly like Grand southern electric. I never had that with the albums preceding 'IV'. Let's dive deeper, e.g. with 'Ripple faced thing'. This song holds this incredible loose piano playing, giving the song a tremendous boost and great variety to the album as a whole. 'Ripple faced thing' holds a 60s feel all around. There are The Kinks references as well, although from the early 70s, like e.g. on the 'Mushwell hillbillies" album. Slight country references creep through the lead guitar sound. Pablo van der Poel sings higher and to top it all of there are these fantastic handclaps. So simple, yet so effective and incredibly groovy. The basis of Grand southern electric remains the guitar and organ that play of each other with the drums backing up both in the middle of the mix. Together they create a Deep Purple like groove. Pablo van der Poel doesn't have this huge Ian Gillan voice, but that fact lends the sound of DeWolff subtlety and different layers of emotions. Most songs are in this category. All are pleasant to listen to and allow Pablo van der Poel to go off into interesting territories with his electric guitar solos. Let's not forget that DeWolff has a master guitarist within it. '(Ain't nothing wrong with) a little bit of loving' starts of small and different. There's the piano again. After a while the song takes a turn back to the more usual sound, but also letting in a little Arctic Monkeys in the riffing and the background vocals. Finally all get to solo some. The longest the band or Marc Neill allow on Grand southern electric. The band returns with the extremely bluesy 'It's about time'. Deliciously subtle, while the guitar has this dirty sound and the organ spews chords out and Robin Piso gets to play a solo that is close in sound to the 'Show me the way' talk box solo of Peter Frampton. Grand southern electric is over before I know it. So back to the beginning where 'Stand up tall' starts again with a great riff. One of the songs that show the progression DeWolff has made in abundance. A very smart move to start this album with this song. Powerful, great melody, a drum solo and great singing. DeWolff is proving to be one of the bands that is going to carry the flame and legacy of a bygone era of classic rock with new songs of rocking quality. A band to watch over the coming years. Live DeWolff proved extremely convincing. In 2014 they have also convinced me for 100% for the first time on record. 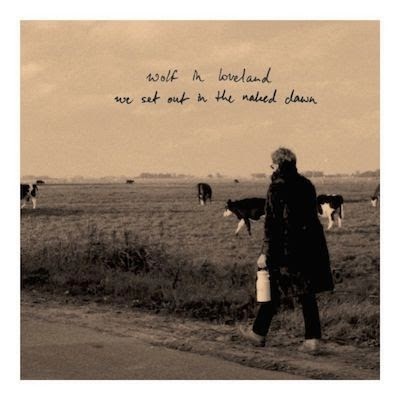 And yes, I have to say it again: another great record from The Netherlands in 2014. There's something in the water! You can listen to 'Dance of the buffalo' here. Wolf In Loveland debuteerde nog geen jaar geleden met een opvallend sterk titelloos debuut. De komst van Wolf In Loveland viel vorig jaar samen met de vermeende komst van de wolf naar Nederland en helaas trok de laatste meer aandacht dan het debuut van band uit Rotterdam. De vorig jaar aangetroffen wolf bleek al snel een flauwe grap, maar Wolf In Loveland is nog altijd bloedserieus. Nog geen jaar na het prima debuut ligt We Sat Out In The Naked Dawn in de winkel. Dat is snel. De tweede plaat na een goed ontvangen debuut ligt voor veel bands behoorlijk zwaar op de maag, maar Wolf In Loveland lijkt er geen enkele moeite mee te hebben gehad. Dat is knap, maar wat nog knapper is, is dat We Sat Out In The Naked Dawn de nodige groei laat horen. 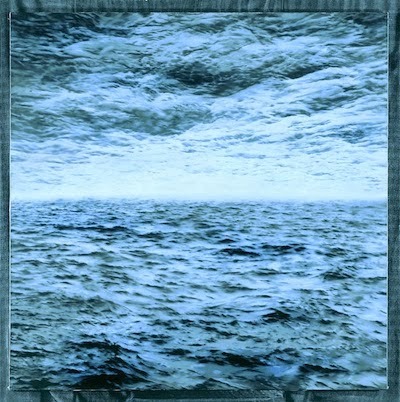 Het debuut van de band propte ik vorig jaar in het hokje folk, terwijl als meest voor de hand liggende vergelijkingsmateriaal Fleet Foxes werd aangereikt. Het hokje folk is nog steeds van toepassing op de muziek van Wolf In Loveland, al zoekt de band de grenzen van het genre meer dan eens op. Ook de vergelijking met Fleet Foxes gaat nog steeds op, al is We Sat Out In The Naked Dawn zo goed dat ik nog maar moet zien dat Fleet Foxes ooit met een plaat van dit niveau gaat terugkeren. Terug naar We Sat Out In The Naked Dawn. Op haar tweede plaat heeft Wolf In Loveland de invloeden uit de folk van het afgelopen decennium verruild voor muziek uit een verder verleden. We Sat Out In The Naked Dawn refereert meer dan eens naar muziek uit de jaren 70 en grijpt hierbij net zo makkelijk naar folkrock en countryrock als naar meer Westcoast pop georiënteerde muziek. Op één of andere manier slaagt Wolf In Loveland er echter ook in om muziek te maken die eigentijds aanvoelt. Dat hoor je direct in de openingstrack die strooit met zonnige gitaarloopjes die de lente onmiddellijk laten beginnen, maar ook refereert aan de even eigenzinnige als briljante muziek van The Go-Betweens of de legendarische gitaarplaten van het Excelsior label. Waar de komst van de wolf vorig jaar met angst en beven werd aangekondigd, maakt Wolf In Loveland muziek die je onmiddellijk wilt omarmen. We Sat Out In The Naked Dawn is een plaat die inspireert tot het noemen van vergelijkingsmateriaal, maar dit is al snel in zo’n ruime mate aanwezig dat het je duizelt (dan weer The Jayhawks, dan weer The Eagles, dan weer een eigenwijs gitaarbandje uit de jaren 90 of de terugkeer van Daryll-Ann). Stoppen met vergelijken en genieten van de prachtige songs is het devies en dat werkt perfect. Wolf In Loveland maakte vorig jaar een positieve indruk, maar heeft deze verruild voor een diepe indruk. De songs op de nieuwe plaat zijn van een hoog niveau en het zijn songs die de zon in je hoofd halen, maar ook de radartjes in datzelfde hoofd flink aan het werk zetten. De instrumentatie op de plaat is prachtig, zeker wanneer de band kiest voor wat meer ingetogen klanken. Ook de zang op de plaat is van grote klasse, waarbij de subtiel toegevoegde vrouwenstem zorgt voor extra diepte. We Sat Out In The Naked Dawn is een plaat die je bij eerste beluistering al vele jaren lijkt te kennen, waarna de plaat bij volgende beluisteringen alleen maar dierbaarder wordt. Kan het toeval zijn dat tijdens het schrijven van deze recensie de zon weer doorbrak na een dag vol wolken? Nee, ik denk het niet. Wolf In Loveland leverde vorig jaar een meer dan aardig debuut af, maar verrast nu met een potentiële klassieker. Het is een klassieker die je mee terug neemt naar de jaren 70, maar hier niet blijft steken. Het is een klassieker die driftig strooit met hemelse gitaarloopjes en oorstrelende songs, maar het is tegelijkertijd een plaat die nergens de makkelijkste weg kiest. Zomaar één van de beste platen van het moment, nationaal en internationaal. Het maakt het des te schrijnender dat het vooralsnog behoorlijk stil blijft rond de tweede plaat van Wolf In Loveland. Geloof me, deze plaat verdient echt een veel en veel beter lot. Je kunt hier naar 'The devil has no home' luisteren. What a weird experience it is to listen to Supernova. Ray LaMontagne is lauded by many in the past circa 10 years. Several now ex-colleagues spoke highly of him as did Hans of Q-Bus Leiden. And me? I just didn't hear it, get it, could not relate to LaMontagne. Then Erwin Zijleman wrote his review of Supernova. What became clear to me was that Ray LaMontagne was off the road and apparently badly. I decided to give Supernova a listen or two, three and more. Supernova slowly grew on me and it seems like we finally have a match. Ray LaMontagne is a singer-songwriter from the U.S. who decided at a later age that he would become a professional artist. When he released 'Trouble' in 2004 he was past 30. This album made him a name in the singer-songwriter section of the musical world. Supernova is his fifth record and a very different one from the music that I'd heard before. Not for 100% as his voice is what it is of course. 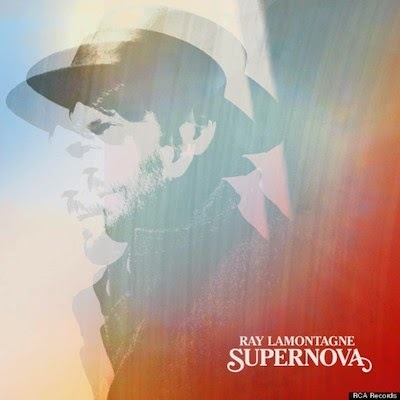 Seen from this angle, Supernova is a brave album, something no one not close to Ray LaMontagne could have foreseen coming. LaMontagne immerses himself in 60s psychedelia, with his acoustic guitar as the mainstay and backbone of the songs. The great combination is the dreamy elements in 'She's the one' and the aggressive fanatical way of singing and the lead notes on the electric guitar. It's loud in parts and holds back, allowing the dreaminess to shine through, all within one song. Just very well done. Supernova is an album that has totally surprised me. At first listen it didn't do very much. A recognition of style at most. The surprise came with each spin there after, those moments that I recognised that something was happening between Supernova and myself. With each aaah-aaah in 'Pick up a gun' the song crept deeper into my conciousness. The album opens with an instant winner though. 'Lavender' is a song that could have been on many an album from the late sixties. The hard played but low mixed acoustic guitar drives the intro. The dreamy psychedelia that settles in, holds the best of the era. The sort of song that many sought to make, but rarely succeeded in. 'Lavender' holds it all. The singing (that is double or multi tracked), the organ, the little notes here and there. The vocal melody that just floats over the music, treated here and there to turn the floating into hovering. The contrast with the second song is huge, as this reminds me more of the traditional Ray LaMontagne. A singer-songwriter song with a hint of Caribbean rhythm, as if the psychedelia of 'Lavender' is just a fad. Not unlike Shane Alexander in the opening song of 'Ladera'. This is not the case. 'Julia' is this stark rocker with 1967 rhythms and guitars. One of the guitars just produces this warble of one stroke or a few warbled notes behind each other. The song is fairly simple, but works quite well and certainly put in this place in the sequence of the album. The soft tones of 'No other way' with some country twangs of a lap or pedal steel guitar tucked neatly away within the song, call up these dreamtime quality again. Lalala seldom sounded so nice as in 'No other way'. Again there's something exotic in the song as well. A reference to a kind of music that does not belong in singer-songwriter music that dipped its guitar into a LSD well. By the time I start looking into who is responsible for all this pleasantness, I read the name of the producer: Dan Auerbach of The Black Keys. Where The Black Keys receives assistance from producer Danger Mouse, Ray LaMontagne turned to one of the most successful artists of the last five years for help. Together they jumped of the deep end and came up tops. Nearly all songs sound extremely interesting in melody and texture. The approach is diverse and that makes Supernova an extremely interesting and rich album. There is so much to discover! 'Ojai' is just a country sort of ballad kind of song. It could have been totally corny, but there are these accents that give it an oomph. These piano notes that come in and go out of the song. A rhythm guitar that just does one stroke on each 4 measures. Thwack, accent. A minor detail, but it provides 'Ojai' with this little extra. After which we're back to the hashpipe and dream away on 'Smashing'. Great diversity again. Ray LaMontagne seems to have jumped on the psychedelia train of 2013. An impulse to his career or killing it off? It is quite a move to make in the conservative kind of music sphere that he was in. Time will tell. As I already wrote, Ray and I finally have a match, so you won't hear me complain. Am I unique? No, I don't think so. 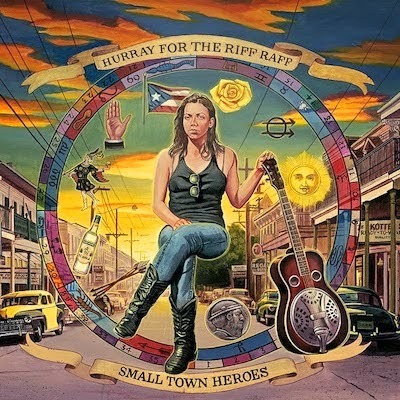 Het uit New Orleans afkomstige Hurray For The Riff Raff maakte twee jaar geleden een onuitwisbare indruk met het geweldige Look Out Mama. Op deze plaat imponeerde de band rond het overweldigende boegbeeld Alynda Lee Segarra met een opwindende mix van traditionele folk en country. Deze mix werd op smaak gebracht met zo ongeveer alle muzikale invloeden die New Orleans de afgelopen decennia heeft omarmd en schuwde ook uitstapjes richting pop en rock niet. Vorig jaar verscheen het aardige, vooral met covers gevulde en als tussendoortje bedoelde, My Dearest Darkest Neighbor, maar met Small Town Heroes ligt de een paar maanden geleden al in de VS verschenen echte opvolger van Look Out Mama dan ook eindelijk in Nederland in de winkel. Small Town Heroes blijkt al snel nog vele malen beter dan de wereldwijd bejubelde voorganger. Gebleven is de focus op traditionele folk en country. Gebleven zijn ook de accenten uit de rijke muzikale historie van The Big Easy. Wat opvalt bij beluistering van Small Town Heroes is dat Hurray For The Riff Raff haar geluid heeft geperfectioneerd. Small Town Heroes is, zeker vergeleken met zijn voorganger, een behoorlijk ingetogen plaat, maar het is ook een plaat die bestaat uit meerdere lagen, waardoor de plaat voor een ingetogen plaat verrassend vol klinkt. De traditioneel aandoende instrumentatie zit razend knap in elkaar en kleurt bijzonder fraai bij de unieke stem van Alynda Lee Segarra. De zangeres van Puerto Ricaanse afkomst klonk op Look Out Mama al als een volleerd countryzangeres, maar legt op Small Town Heroes nog wat meer emotie en doorleving in haar stem. Wanneer Alynda Lee Segarra zich vergrijpt aan een murder ballad staat het angstzweet in je handen, wanneer ze een verbroken relatie bezingt treur je intens met haar mee. Natuurlijk zijn er veel meer bands en zangeressen die hun inspiratie halen uit het rijke verleden van de Amerikaanse country en folkmuziek, maar Hurray For The Riff Raff klonk op Look Out Mama al uniek en heeft haar unieke positie in het muzikale landschap van het moment op Small Town Heroes alleen maar versterkt. Small Town Heroes is een plaat met vele geluiden. Dit is deels het resultaat van het gebruik van uiteenlopende elektrische en akoestische instrumenten, maar Hurray For The Riff Raff is ook niet vies van het verwerken van invloeden uit uiteenlopende genres. Het ene moment waan je je in de Appalachen van de vroege 20e eeuw, het volgende moment wandel je door Nashville, zit je op een veranda in het diepe zuiden van de Verenigde Staten of snuif je de muzikale erfenis van New Orleans op. Van Gillian Welch tot The Carter Sisters. Van Lucinda Williams tot The Cowboy Junkies from Nashiville. Desondanks voelt Small Town Heroes aan als een geheel. Het is een geheel dat de leefwereld van Alynda Lee Segarra op muziek zet. Small Town Heroes maakt je deel van deze leefwereld en als je er eenmaal in zit kun je niet meer zonder. Small Town Heroes is een fascinerende plaat van een nog wat groter gegroeide band. Je kunt hier naar 'I know it's wrong (but that's alright)' luisteren. 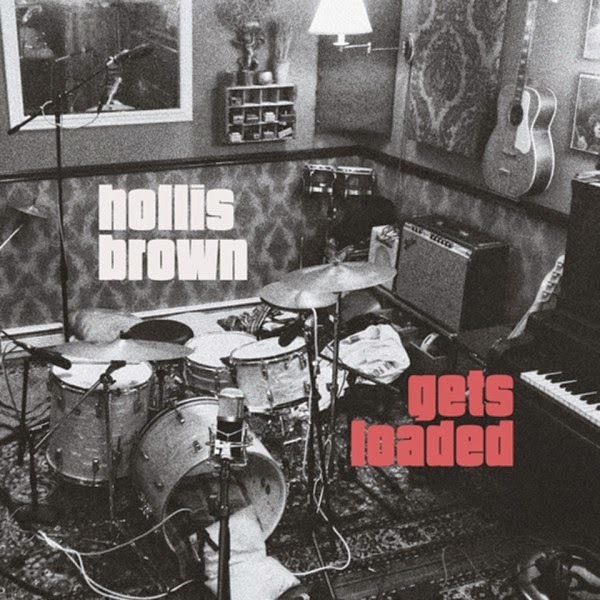 Last year there was quite some attention on this blog for the debut album of Hollis Brown. Now the band is back with a new album. The strange thing is that it is a new album, but there's not one single new song to be found. 'Ride on the train' was an album with songs that were a mix of early to mid 1970s influenced songs. From CCR to The Eagles, traces of those bands could be found for all with the right ear for the music. On Gets loaded Hollis Brown brings a tribute to a band that, rumour has it, hardly anybody saw play in the five years it was together, but that everyone who did see the band play, started his or her own band straight away. This band is one of the elusive mysteries in music that only a few bands share: totally unsuccessful (commercially), but hugely influential. We are speaking of The Velvet Underground here of course. And those who know the repertoire of that band have guessed which album is being covered here integrally: 'Loaded', the 1970 swan song of The Velvets. Integral is not completely correct as the album starts with that treacherously sweetest of The Velvet Underground songs 'Sweet nothings' and ends with 'Who loves the sun'. Surprising also, as 'Loaded' is not exactly the most critically acclaimed album of the band. This almost necessarily becomes a post about 'Loaded' and Gets loaded, The Velvet Underground and Lou Reed more than Hollis Brown. Still, you will find that the balance is there and a surprising conclusion or two are divulged. Let's start with that this is a quite pleasant surprise. Lou Reed's career in most obituaries that I read was comprised to the four albums he made with The Velvet Underground and a 44 year solo career was sort of hidden away, disappeared almost. Hollis Brown participated in a Lou Reed tribute in his and its home town of New York City and decided to extend this tribute with a whole album. I had bought 'Loaded' as an album somewhere in the 80s, probably second hand. It was one of the two or three albums in my possession that someone decided to put a steaming cup of tea on top of the sleeve. A killer for the vinyl record inside I can assure you. Hence, I sort of forgot about it and it wasn't my favourite one anyway. That were 'The Velvet Underground' and 'VU'. So that makes Gets loaded a sort of re-acquaintance with 'Loaded'. The Velvet Underground is best know and respected for its songs without mercy or compromise. 'Sister Ray' is at the high top of all that. Unlistenable avant garde noise. Relentless sensory overload. And then there is this other side. The side in which Lou Reed let out all the other influences of his youth. The sweetest ballads, rock and roll, doo wop and even a little country. They can be found on all albums with the exception of 'White light/White heat'. All these influences came out in the songs on 'Loaded'. And Hollis Brown makes these songs come alive as if they were written in the past few months. A song like 'Lonesome cowboy Bill', which I've always considered mediocre at best comes out trumps and shiny in this version. The same goes for 'Head up high'. The song is turned into a Creedence like blistering rocker. Where The Velvet Underground was on its very last legs in 1970, despite holding two songs that would remain a part of Lou Reed's set for most of his life, Hollis Brown attacks 'Loaded' with fresh energy. In short making Gets loaded a better album than 'Loaded' ever was in my opinion. This band was having fun when it re-created 'Loaded', Lou Reed was on his last legs and unbelievably chagrined in his playing, but most certainly his singing, putting a negative stamp all over 'Loaded'. By then I'm totally convinced that Hollis Brown made a great move with this recording. And the two "hits" of 'Loaded' still have to come. 'Rock and roll' and 'Sweet Jane'. My favourite was always 'Sweet nothings' though. The song that ends this feast of recognition and re-acquaintance, 'Who loves the sun', the last song here, underscores everything that I wrote before. This song shows all Reed's loves in music from his youth including some doo wop, the subject is dark, but sweet in execution, but Hollis Brown sings this so much better, making it, well, a classic song. Just what it deserves to be. What a feast Gets loaded is. Life is full of surprises and Gets loaded is one of them. Just unwrap and enjoy these little surprises. No questions asked. It's just what I'm doing right now. 43 Years after its release 'Loaded' has received a statue that no music fan ought to miss. Gets loaded is one of the best albums released this year so far. You can listen to 'Get loaded' on Spotify. One of the most intense live performances I've ever seen was of Sixteen Horsepower in Nighttown in Rotterdam. The devil seems to be permanently on the tail of David Eugene Edwards. Sixteen Horsepower soon after disbanded, to my surprise and Edwards came back under the name Wovenhand. Some more experimental albums followed and I sort of gave up. Last year a friend showed me a dvd recorded in The Netherlands of Wovenhand and recognised all that impressed me so much in 2001 or 02. And now there is Refractury obdurate. I don't even know what the title means. Google translate doesn't help here. I don't care. I'm sucked into this album. Refractury obdurate is louder than I remember the band. More direct, with lead electric guitars that point the way. What remained is David Eugene Edwards singing through his mouthharp microphone making him sound like a voice from an ancient past. A voice of biblical proportions. Which in a way it is. Biblical references are all over the place. The struggle between earthly pleasures and saintly living is a permanent one in the world of David Eugene Edwards. 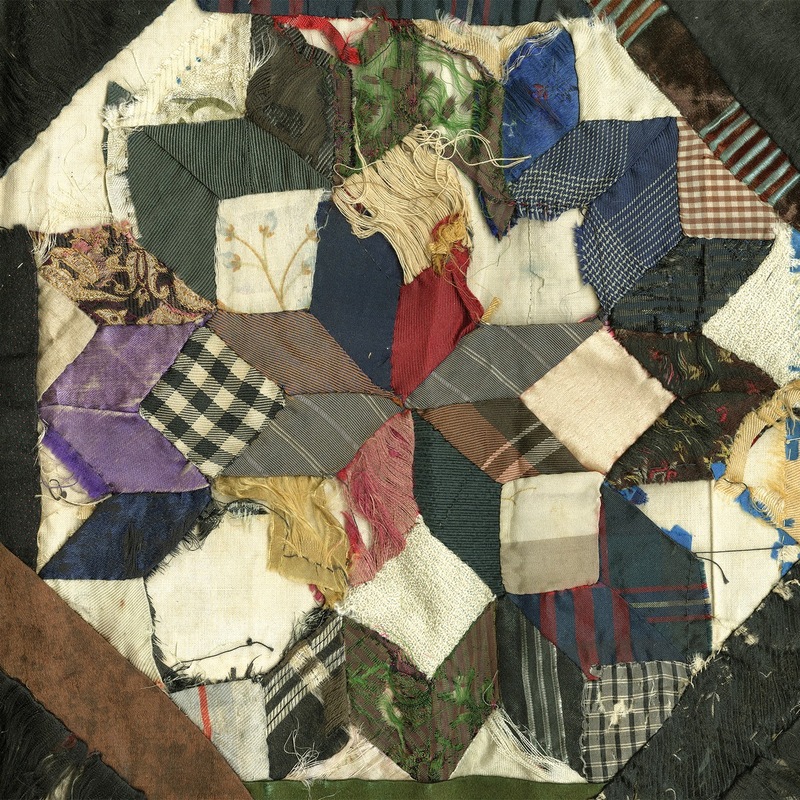 Wovenhand musically balances on a thin chord between folk, gospel, rock and country. The basic ingredients that distilled rock and roll. It is the rock side that is allowed into the mix more than ever. Despite the fact that electric noise is let in here more than ever, it does not change the tenseness of Wovenhand's music. 'The refrectory' holds this all, including some brilliant sounding chord changes. If anything, I'd say that David Eugene Edwards has listened to some Britpop recently. The way the guitars are played with the joyous solo lines, are unmistakeable. 'Good shepherd' has all that and still there's this tenseness and invoking of the Lord. 'My good shepherd' is sung again and again. I won't go so far that this is a hitsingle, too loud and noisy, but Edwards has never come so close. There is a pop rock element to 'Good shepherd' that is new to him. An extremely earthly element. And it does the music good. All this means that the more country and folk side of Wovenhand is pushed backwards. No banjos or bandoneons here. Mostly loud guitars and some organs. The songs are the same though. It is not hard to imagine the traditional instruments in the songs. They're just left out this time round. David Eugene Edwards rocks out and does so in a grand way. Majestic and without subtlety but never denying his sort of music. Refrectory obdurate is an album to play loud. An album to immerse oneself in. An album to let oneself go into. If you manage to do just that it becomes something very special. Thanks to or despite all the Lord invocations, depending on how you looks at those things. I'm surprised how hard David Eugene Edwards can rock, but on the other hand I'm not. It's just a different guise of his music. It's just as easy to imagine an electric guitar or five to Sixteen Horsepower's songs. The relentless pace of some songs, that is a real surprise. Refracturate obdurate is an impressive, thick wall of an album. There's no way around it. Either you go over or turn back. Refracturate obdurate is the real thing. You can listen to 'Hiss' here. Since some months WoNoBloG runs a special series with albums from 1968 and 1969, with the likes of Blue Cheer, Blood, Sweat & Tears and Spooky Tooth. Here's another contribution to this series. In spring and summer of 1969 I was exposed to a sort of music for the first time in my life of which I only learned two or three years later that it went under the name reggae. Thanks to a special on Belgium television. Desmond Dekker (& the Aces) scored a number one hit with the song 'Israelites' in the Radio Veronica Top 40 in the spring of 1969. A very atypical song for the time, but followed by several other songs by Max Romeo and Jimmy Cliff. Being 9 years old, I assumed that the song was about Israel. It is not. It is about working hard for money to keep a family, were it not that the wife left with the children and the "I" does not want "to end up like Bonnie & Clyde". In other words about life on the fringes of society. Later in the year Desmond Dekker & the Aces scored a second hit 'It mek' of which I do not have any recollection. 'Israelites' is a song that can be heard to this day. 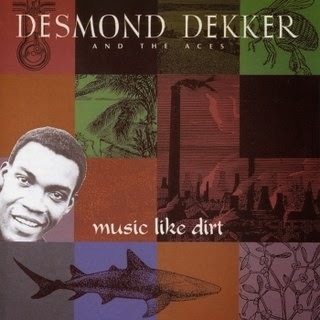 Looking for music by Desmond Dekker & the Aces I found this album: Music like dirt or 'Intensified '68, what appears to be the original name of the album. An album without 'Israelites' on it. Desmond Dekker produces music that is standing on two principles. On the one hand there is an older form of reggae, rocksteady and ska, while other songs are more reggae as the world would get to know it in the 1970s thanks to Bob Marley. Not unlike the music UB 40 unleashed on the world with its first 'Labour of love' album in the 1980s, that spawned so many (no. 1) hitsingles. Music like dirt is an upbeat album. On the one hand because of the music that is so deliciously fun sounding. This has nothing to do with the quality of the recording. This is mono, with a sense of depth of instruments stacked behind each other. No, it is the backbeat that invites me to move my limbs. Even when sitting down typing this post, I'm moving my head, neck and shoulders. To the rhythm, but also to the guitar eruptions or the horns that kick in every once in a while. The other hand is about the voice of Desmond Dekker. Dekker simply has a very pleasant voice to listen to. A bit high perhaps, but far from irritating. This is the only way to listen to Desmond Dekker that is left though. He died in 2006 at the age of 64 of a heart attack in London. He was born as Desmond Adolphus Dacres in Kingston, Jamaica in 1941 and started recording in 1963. His first hit in the U.K. was in 1967 with '007 (Shanty town)'. Reggae has never particularly appealed to me. Somehow to serious and monotonous. This problem is nearly taken away by Desmond Dekker. The way the reggae rhythm is played on Music like dirt, it is infused with a pop element and the joy of singing harmonies. Dekker and his Aces, Wilson James and Easton Barrington Howard, weave their voices together in intricate ways. High, low and in between. A few songs stick out. I just love 'Rudy's got soul'. What a fun track. 'Personal possession' is heart felt, and I can only imagine what it could have sounded like nowadays. There's a lot of tape hiss on these recordings. And the hit? As said it's not on this album. The other one is. 'A it mek' was a logical choice listening to it in 2014. The rhythm and sound resemble 'Israelites' up to a certain extent. Having said that, the song has it's own quality. Just listen to the horn section and is just a little bit more upbeat. It can never compete with the impression imprinted in me 45 years ago, but may actually be a nicer song. The more Music like dirt moves on, the more the songs turn into "real" reggae, while at the same time a song like 'Don't blame me' is so 1950s non-rock & roll U.S. music. A blend of two cultures and a good as well as nice blend it is. Music like dirt is an unexpected pleasure. I expected nothing from this album, was presented with a sort of music that I know little about and was hardly familiar with. It managed to surprise me. This will not be the last time I've played Music like dirt, no matter how poor the recordings sound. Music like dirt is fun and has quality. You can listen to 'It mek' here. De naam Karen Jonas deed bij mij niet direct een belletje rinkelen, maar toch is ze zeker geen onbekende op deze BLOG. Karen Jonas maakte een jaar of twee geleden deel uit van het duo The Parlor Soldiers, dat met haar debuut When The Dust Settles niet alleen goed was voor de lancering van de rubriek ‘minder bekend of miskend talent in het roots segment’ op de zaterdag editie van 'De krenten uit de pop blog', maar bovendien één van de beste rootsplaten van het betreffende jaar afleverde. De andere helft van het duo, Alex Culbreth, dook vorig jaar al op met een soloplaat en nu is het dan de beurt aan Karen Jonas. Karen Jonas moest bij The Parlor Soldiers meestal genoegen nemen met de achtergrondvocalen, maar deze droegen wat mij betreft nadrukkelijk bij aan het totaalgeluid van het duo, dat uiteindelijk helaas maar één (wereld)plaat afleverde. Gezien de belangrijke rol die Karen Jonas speelde bij The Parlor Soldiers, was ik heel nieuwsgierig naar haar solodebuut Oklahoma Lottery, dat inmiddels al een tijdje zijn rondjes draait in mijn cd-speler. Dat de zang op het solodebuut van Karen Jonas geweldig is zal een ieder die het debuut van The Parlor Soldiers koesterde op zich niet verbazen, al was de stem voor mij nog een stuk imposanter dan ik had verwacht. Karen Jonas heeft een bijzonder eigen geluid dat zowel zeer krachtig als voorzichtig breekbaar kan klinken; een waardevolle gave in het alt-country genre waarin Karen Jonas opereert. Haar songs variëren van uptempo tot ingetogen en bestrijken binnen het alt-country genre het breedst mogelijke terrein. De krachtige stem van Karen Jonas staat centraal op Oklahoma Lottery, maar ook de muzikanten waarmee ze de studio in Fredericksburg, Virginia, is ingedoken maken indruk. Het snarenwerk, waaronder fraaie pedal steel partijen, is geweldig, maar ook de stuwende ritmesectie verdient een pluim. Het past allemaal prachtig bij de alleen maar beter wordende stem van Karen Jonas en haar afwisselende maar altijd energiek en opwindend klinkende songs. Hoewel Oklahoma Lottery over het algemeen zal worden voorzien van het etiket alt-country valt hier ook wel wat op af te dingen. Karen Jonas schuurt af en toe dicht tegen de meer traditionele country aan en verrijkt deze met blues, rock ’n roll en Southern twang. Het doet me af en toe wel wat denken aan de geweldige platen van Sarah Borges wiens Silver City (2005) behoort tot mijn persoonlijke favorieten (en wiens vorig jaar verschenen plaat ik nu pas heb ontdekt). 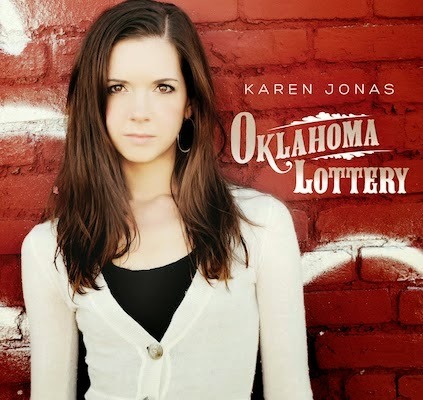 Oklahoma Lottery van Karen Jonas is al met al een bijzonder aangename verrassing. Het is een plaat met prima songs, een mooi verzorgde instrumentatie en productie, een stem die zwoel kan verleiden en stevig kan uitpakken en hierbij ook nog eens een heleboel plezier, want dat spat werkelijk van de plaat af. Vorig jaar liet Alex Culbreth al horen dat er leven is na The Parlor Soldiers. Karen Jonas doet het met Oklahoma Lottery wat mij betreft op nog veel indrukwekkendere wijze. Een van de uitschieters in het rootsaanbod van het moment. We're nearly 2.50 minutes on route with Luminous. Nearly three minutes of electronic warbling music, not unpleasant, but also not going anywhere. Just stacks of synth sounds. And then the song explodes into something like a U2, Simple Minds, I don't care, even Depeche Mode infused rocksong with a Madchester lightness and beat. The combination just totally works and is totally 80s. A huge sound, created for stadiums. Guitars like jet engines, light sounding lead lines from a synthesizer. Pounding drums and bass. The light sounding voice of Faris Badwan floats over, well, everything else. In this way The Horrors finally, truly seems to have found its own voice. The Horrors started in 2005 in Southend-on-Sea in the U.K., releasing its debut album, 'Strange house' in 2007. This was followed by 'Primary colours' in 2009 and 'Skying' in 2011. The first album didn't do anything with me. 'Primary colours' set a little better with me, but perhaps more from the surprise in the difference between the two albums. 'Skying' was listened to more often and was reviewed in the PDF version of WoNo Magazine of old. 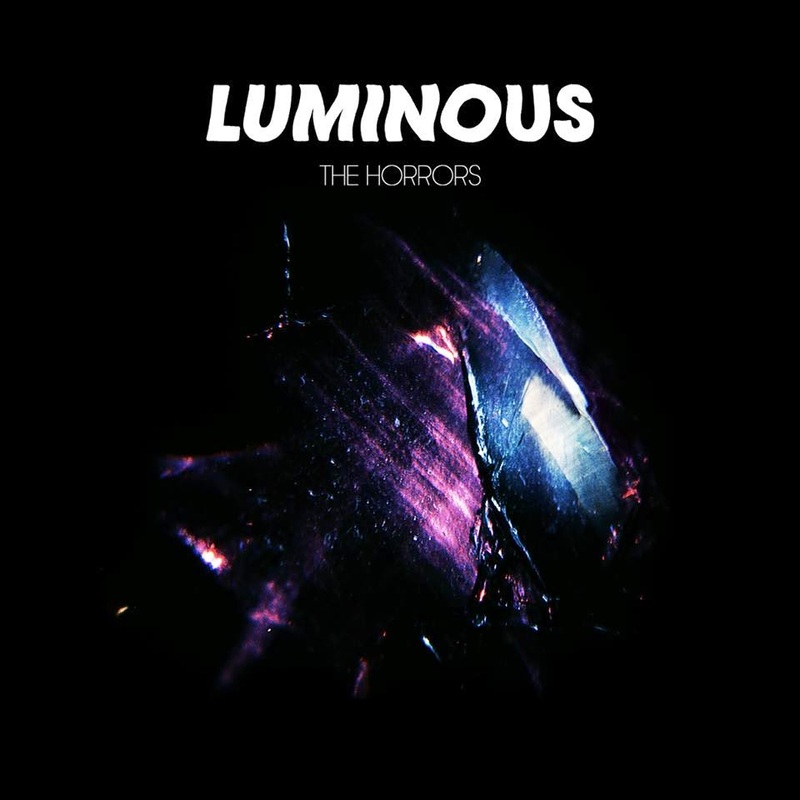 It is with Luminous though that The Horrors and I truly meet up. In a way this is strange as Luminous totally goes 80s in sound, in atmosphere and in form. But as with many other band active in the 10s, it lacks the total gloom of the impending doom that hovered over the 80s. Welcome to the age of denial? That is for sure, but the slow threat of global warming, empty seas, melting ice caps and thawing tundras is harder to grasp and see than imminent nuclear disaster. Hence the sense of melody in the music of The Horrors or just a perfect blend of musical styles? Depeche Mode with Soft Cell? That is what I notice most it seems. The darkness blended with the melancholy music and melody of Marc Almond and David Ball. 'Say hello, wave goodbye' and 'Torch' is all over Luminous. 'First day of spring' is 100% Soft Cell with an electric guitar in there. With a little Tears for Fears of 'The hurting' and China Crises as a desert. Meaning a rare blend of electro disco with an electronic form of rock. It is because these references that I'm attracted to Luminous. The sort of 80s music that I could stand for a few songs at a time. Is this the same for Luminous? No, I sit out the album without a problem. There is hardly any 80s album that can claim that and that includes albums from that decade by some of my really favourite artists as well. Why? Again, because of that rare mix The Horrors seems to have made. I can't really put my finger on it to be honest, but there is an element in here that was missing (over) 30 years ago. The sound is better, but that's not it. My best guess remains with the lightness of the sounds. The downside of this all is that The Horrors may be doing a trick. Look at us doing a 1980s blend/band. The way from 'Strange house' is not exactly a logical one. The albums could not be further apart. A sin of the band's youth or a record that did not work, so it made a career switch? Whatever the answer, let's enjoy Luminous in the meantime. This album holds enough to enjoy, so we can hold back on scepticism. And, the step from 'Skying' is not so strange. More refined Luminous is for sure, but the two albums are not far apart. Luminous is a cluttered album. The sound is full and very present. Synthesizers come from everywhere, drums fill everything. Every once in a while delightful details escape the dense forest of sound and over this all the sun shines. In this sense 'Change your mind' is the odd one out on Luminous. A fairly empty, ballad like song. The rays of light come Faris Bagwan's voice. Rays lighting up all below it. Dreaming away on a sunny afternoon. And thus the secret may just have been revealed anyway. You can listen to 'I see you' here. Several ago John Paul Keith played the Q-Bus in Leiden. As more or less promised at the end of the well-read review of his show, here is the review of Memphis circa 3AM. The only John Paul Keith album in my possession before the show, was The man that time forgot' (2011). This album had its moments, but overall shot off in too many direction to really make a lasting impression on me. This hadn't changed over the years I noticed as I "prepared" myself for the Q-Bus show. I went anyway because I was fairly sure that I was in for a treat live; and wasn't disappointed. 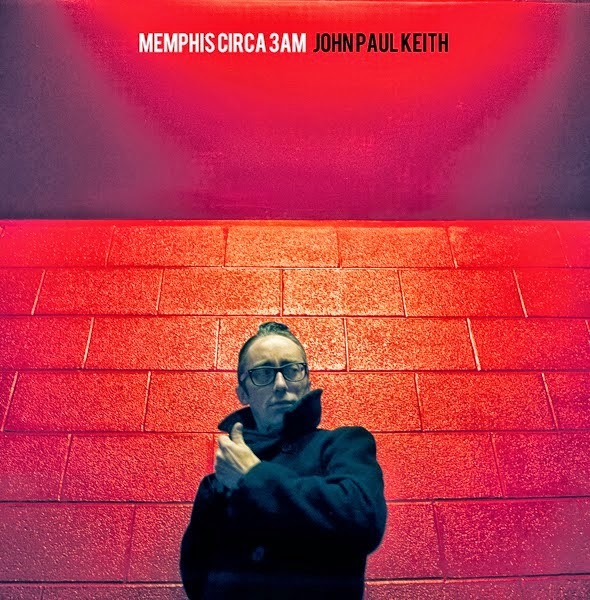 That made me buy Memphis 3AM to give John Paul Keith a second chance on record. Again I wasn't disappointed. The Johnny Cash like chooga choogy rhythm of 'There's a heartache gong 'round' is not my style, nor is another more country like song. JP loses me for a while at those points. By then it is forgiven. This album has a lot of songs on it that I do enjoy, greatly. John Paul Keith is a retro rocker. There's no other word for what he does. Not a song goes beyond 1970 if not 1965, a pre The Beatles era of good old American rock as made by the likes of Roy Orbison, Ricky Nelson, Elvis, Johnny Cash and The Everly Brothers. And all songs with a signature guitar solo, as JP Keith is a fab guitarist, having mastered several styles, which makes his playing varied and nearly every time of interest to listen to intently. Sure country comes by again, 'Ninety proof kiss', is as country as country goes, but great to sing along to in bars and venues. On record with a nice rolling Jerry Lee style piano solo. 'If you catch me staring' is sort of an early The Beatles song or any other so called Merseybeat song. A mix of 1963 Liverpool and Roy Orbison. The guitar and piano work is so beat era, the singing Orbison. A great mix of two styles. With 'Walking along the lane' one of the absolute highlights of Memphis 3AM comes by. A rolling song, somewhat honky tonk, which ends far too soon, but let's not forget the pleasant way this album starts. The driving rock of 'You really ought to be with me', with the rhythmic organ playing and rolling drums, is a fantastic opening song, that sets the stage for many a thing to come. With a blistering guitar solo to boot. Stevie Ray Vaughan with a melody. A song that has been done a million times before and still manages to stand out. It is followed by the darkness of 'We've got all night'. Chris Isaak in 2013 with a darker edge. Deep guitar lead notes. Next is 'Everything is different now'. This song invokes a million memories as well, but has all it takes. 'True hard money' sounds like anything The Rolling Stones or The Fabulous Thunderbirds used to play a long time ago. Yes, John Paul Keith is a retro rocker, who excels live, but on record knows how to make his version of old truths shine also. I may not like all the styles that Keith chooses to explore, all are done in good taste. And the good thing is, that when he does a John Paul Keith, like in 'Walking along the lane' he shines just this little extra. Memphis 3AM may not be for everyone, but if you enjoy good time mid to late 50s and early 60s music in a modern sound, you can't do much better than this album. Enige maanden terug schreef Wo. al een lovende recensie over het verrassend goede, nieuwe soloalbum van David Crosby. Vandaag is het de beurt aan Erwin Zijleman de loftrompet af te steken. Ik heb van David Crosby maar één soloplaat in mijn bezit en dat is er direct één die nauwelijks of waarschijnlijk zelfs niet is te overtreffen. If I Could Only Remember My Name uit 1971 behoort tot de kroonjuwelen van de popmuziek en is met afstand de beste soloplaat die David Crosby heeft gemaakt. Croz, zijn eerste soloplaat in een jaar of 15, zaagt dan ook niet aan de stoelpoten van de klassieker van weleer, maar is wel een bijzonder aangename plaat, die me beter bevalt dan de muziek die Crosby de afgelopen jaren heeft gemaakt met zijn band CPR. David Crosby is de 70 inmiddels gepasseerd en is ondanks stevig gebruik van meerdere minder gezonde genotsmiddelen nog altijd in leven (al heeft hij de afgelopen jaren al enkele keren op het randje van leven en dood gebalanceerd). Dat hij ook nog een hele fatsoenlijke plaat kan maken bewijst hij met Croz. Crosby heeft gezien zijn staat van verdienste flink wat te besteden wanneer hij de studio in duikt en het zal dan ook niemand verbazen dat Croz werkelijk prachtig klinkt. Bij eerste beluistering moest ik op één of andere manier vooral aan de betere platen van Toto denken en dat vind ik persoonlijk niet zo erg. Nu liet Toto zich nadrukkelijk beïnvloeden door de popmuziek zoals die in de jaren 70 in Californië werd gemaakt, dus heel ver van huis is David Crosby op zijn nieuwe plaat niet geraakt. De gastenlijst op Croz is imposant en bevat grote namen (waaronder die van Mark Knopfler), maar er wordt smaakvol en behoorlijk ingetogen gemusiceerd, waardoor Croz lang niet zo glad en overdadig klinkt als ik op basis van de gastenlijst had verwacht. Bij dit soort platen ligt overproductie op de loer, maar daarvan is op Croz zeker geen sprake. David Crosby vermaakt op zijn nieuwe plaat met mooie songs en een smaakvolle en stemmige instrumentatie die vaak jazzy accenten legt. Echt opzien baart hij misschien niet, maar dat kun je ook nauwelijks verwachten van iemand met het oeuvre van David Crosby. Wat wel opvalt is dat David Crosby op zijn 72e nog uitstekend bij stem is. Dat hoor je zeker in de harmonieën die Crosby samen met zijn muzikale gasten heeft ingezongen en die herinneren aan de hoogtijdagen van Crosby, Stills & Nash, maar ook de solo-vocalen klinken soepel en laten nog maar weinig slijtage horen. Croz is zoals gezegd een aangename en goed gemaakte plaat, maar het is ook een plaat die groeit als je hem vaker hoort. Dan blijkt dat de meeste songs op Croz lekker blijven hangen en aan kracht winnen. 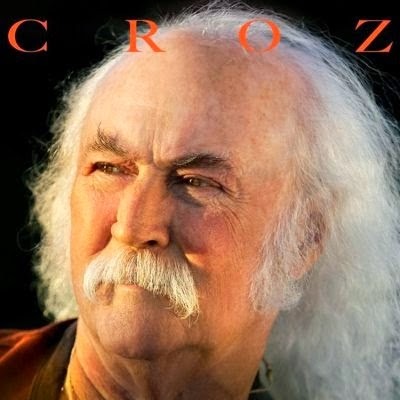 Heel overdreven moeten we niet doen over deze eerste soloplaat van David Crosby in heel veel jaren, maar er zijn heel veel muzikanten die alleen maar kunnen dromen van een plaat van het niveau van Croz. Alle reden dus om heel tevreden te zijn met deze prima plaat van een icoon uit de geschiedenis van de popmuziek. Je kunt hier naar 'Find a heart' luisteren. Noah Gundersen heeft een platencontract en heeft met Ledges tot dusver al redelijk wat aandacht gekregen; met name in Engeland waar de critici driftig met superlatieven strooiden voor een muzikant die volgens deze critici zomaar in de voetsporen van Ryan Adams zou kunnen treden. In Nederland is het tot dusver relatief stil rond Ledges en dat is zonde. Ledges is immers een fantastische plaat, die inderdaad wel wat doet denken aan de inmiddels al bijna vergeten Ryan Adams. Ledges is niet het debuut van Noah Gundersen. De muzikant uit Olympia, Washington, bracht in 2008 in eigen beheer al een plaat uit en heeft ook een live-plaat en een aantal EP’s op zijn naam staan. Ze zijn lang niet zo goed als zijn officiële debuut Ledges, dat direct vanaf de eerste noten indruk maakt en hier pas mee stopt wanneer de laatste noten van de laatste track al een tijdje zijn weggeëbd. Gundersen legt de lat direct hoog en opent met een deels a capella en een deels sober ingekleurde track, waarin hij samen met zus Abby verrast met doorleefde vocalen en een rootsgeluid dat is verrijkt met gospel. Invloeden uit de gospel hoor je vaker terug op Ledges. Noah Gundersen is afkomstig uit een zeer religieus gezin, waarin gospel lang de enige toegestane muziek was. Dat heeft zijn sporen nagelaten en geeft de Gundersen uiteindelijk een bijzonder eigen geluid. Na de eerste paar coupletten ben je verkocht en is het duidelijk dat Noah Gundersen met Ledges een hele bijzondere plaat heeft gemaakt. Het is een plaat die zich vooral laat beïnvloeden door Amerikaanse singer-songwriter muziek uit vervlogen tijden. Noah Gundersen slaagt er hierbij in om meerdere invloeden te combineren. Deze variëren van de al genoemde gospelinvloeden uit het diepe Zuiden van de Verenigde Staten tot invloeden uit de singer-songwriter muziek uit de Canyons rond Los Angeles, West Coast pop, countryrock uit de Californische woestijn en een vleugje modernere alt-country. Ledges is uitgebracht als een soloplaat van Noah Gundersen, maar de naam van zijn zus Abby had wat mij betreft ook best op de cover mogen prijken. Haar vioolspel geeft Ledges immers een prachtige melancholische ondertoon en hiernaast tillen haar achtergrondvocalen de zang van haar broer naar grote hoogten. Ledges is een pure plaat zonder poespas. Noah Gundersen maakt Amerikaanse rootsmuziek zonder echt verrassende uitstapjes, maar compenseert het gebrek aan vernieuwing door heel veel emotie in zijn songs te leggen. Ledges doet ook mij zoals gezegd wel wat denken aan de muziek van Ryan Adams en dan met name aan de man’s briljante debuut Heartbreaker. Vergeleken met Ryan Adams moet Noah Gundersen het doen met een aanmerkelijk bescheidener budget, maar de eenvoud is misschien wel de grote kracht van Ledges. Ik heb persoonlijk een voorkeur voor de songs met flink wat dynamiek, maar ook als de songs van de Amerikaan wat rustiger voortkabbelen houdt hij de aandacht moeiteloos vast en hoor ik opeens wel wat van Damien Rice in zijn muziek. Ik heb Ledges inmiddels heel vaak beluisterd en twijfel al lang niet meer over mijn oordeel. Ledges is met name door de eenvoud en de emotie met gemak één van de beste rootsplaten van het moment. Dat hebben we in Nederland tot dusver nog niet door, maar dat is een kwestie van tijd. Let maar op. Je kunt hier luisteren naar 'Ledges'. Drop is a favourite Dutch sweet, although the term sweet is not to be taken literal necessarily. The black, sticky substance can come in all sorts of shapes, sizes and taste. Licorice is the English translation. During a visit to Verona in Italy last summer (ca. 40 degrees C) I was totally surprised by the smell in a shop I stepped into to buy something to drink: licorice. In Italy! Drop is also the title of the latest Thee oh Sees album. Following up on 'Floating coffin', that received a favourable review on this blog only about a year ago. Drop acid is a term that was used a lot in the first Summer of Love in 1967. Looking at the cover of Drop, that could be a the meaning of this title. The trip following the dropping does not like a good one. More like the paranoid kind, the nightmarish variant in one is being followed it seems. What is real, what is not? In such dreamlike states it is often hard to tell. The music on Drop is psychedelic, murky, darkish. Everything is made just this little bit uglier than strictly necessary. Presented in such a way that listening to Drop because it sounds nice is no option. The music is presented in an obscure way, cluttered. The search for beauty is made harder, but search and you will find. This is, in the end, a trip with a happy ending. 'Floating coffin' was my first Thee oh Sees album. I took a sort of instant liking to it, but I have to admit without making it a permanent relationship. What it did leave behind was a curiosity for more music by Thee oh Sees. So Drop was listened to straight after I found out about its existence. As you'll have discerned from the long intro, it did not disappoint. From the very opening I have a shortage on ears. There are so many sounds in 'Penetrating eye'. Some sound like concrete, the rhythm guitar sounds of grunge heroes The Smashing Pumpkins, some elusive, at times even irritating small sounds,, hidden beneath or lurking on top of vast layers of sound. Where does this come from? 'Encrypted bounce' is more straight forward. The rhythm leads the way here, but also here the lead guitar(s) go off in backwards direction or other strange treatments. The trip really starts in the third song. Hash pipes or LSD savoured sugar cubes take your positions now. 'Savage victory' is the musical equivalence of a trip. The Mellotron is swerving around like a flying carpet on an erratic wind. The vocal melody sounds insecure as well. It is the snare drum and the rhythm guitar that give 'Savage victory' its body. Steady and unsteady at the same time. Bass-bam-bass-bam-bass-bam-bambambambam. Extremely hard to hold on to. By the time 'Put some reverb on my brother' sounds through my headset, Drop has shown that this is a no bars left, anything goes sort of album. This song has a delightful acoustic version that reminds me of The Rolling Stones of 1967, but takes some twist that could be on 'Their satanic majesties request' as well. The best song so far is the title song, 'Drop'. A jagged rocker, with a great 'aaahhhaaahhaa' part in it. Just a little bit more melody. Either by listening longer into Drop I get more in the mood for/of Drop or the songs become better. 'Camera (queer sound)' is a song The New Pornographers would have been quite content with. John Dwyer's voice delivers a bit better as well. 'King's nose' could have been on Jacco Gardner's album. I wrote enough here, for you regular followers of this blog. 'Transparent world' is extremely dreamy and floating. Or submerges like the first tea that comes out of the bag after being submerged in boiling water. Those moments before it totally takes over. 'The lens' is the last song. This slow psychedelic ballad is quite to my taste. The right melody, the dark sound of a cello and wald horns or something like them. 'The lens' is an utterly playful song, serious, but playful. Thee oh Sees has found a perfect balance here, that would have scored a hit in 1967-1968. If I have to write something negative about Drop, it is that the sound is very murky, which at times makes it hard to discern what is going on in all the darkish corners of the songs. And a lot is going on, I can assure you. On the other hand, this could indicate that the album can grow over time. The other thing is that Drop may prove to be so 2013. No one was waiting for another psychedelic record come summer 1968, while in the spring of that year it was still considered very trendy. 'Lazy Sunday', anyone? The Beatles led all away with 'Lady Madonna' in the spring. The Rolling Stones followed with the first song of the cycle that would really define its career: 'Jumping Jack flash'. With just more than 31 minutes it is all over. Thee oh Sees can be lauded for not overly extending their songs unnecessarily. Despite of a bit of a dip in second half of Drop, the album has a selection of great songs, that, despite the aural mist created in several of them, sounds clear. A lot of attention must have gone into the production and mixing of Drop. It's time to admit I like Drop, just like I liked 'Floating coffin'. You can listen to Drop'' here. Laat ik maar meteen met de deur in huis vallen: Maggie Brown heeft een geweldige plaat afgeleverd. Maggie Brown is geen zangeres (een zoektocht op het Internet brengt je bij zangeressen, actrices, journalisten en zelfs een restaurant), maar een vijfkoppige band uit Amsterdam. Het is een band die je met haar titelloze debuut direct met de eerste noten bij de strot grijpt en vervolgens 11 tracks lang naar adem laat happen. De band zet hiervoor uiteenlopende middelen in. Het titelloze debuut van Maggie Brown opent met een prachtige instrumentale track (Alaska). Het is een track die je laat wegdromen op melodieuze gitaarklanken en die steeds naar een climax lijkt toe te werken die uiteindelijk niet komt, waardoor de track maar blijft intrigeren. In de tracks die volgen verleidt Maggie Brown met zonnige gitaarpop die perfect past bij de onverwacht opgedoken lente en herinnert aan de perfecte gitaarplaten van het Excelsior label, met gitaarmuziek met invloeden uit de Amerikaanse rootsmuziek vol mooie harmonieën (in track drie lijken The Jayhawks weer opgestaan), met ingetogen meer folk georiënteerde songs of juist met net wat gruizigere en minder makkelijk te doorgronden songs die met enige fantasie in het hokje postrock kunnen worden geduwd, al blijven de bij dit genre horende uitbarstingen grotendeels uit. Maggie Brown kan in al in deze genres uitstekend uit de voeten en slaagt er bovendien in om alle invloeden (waaraan invloeden uit de alternatieve Amerikaanse gitaarrock uit de jaren 90 zeker moeten worden toegevoegd) samen te smelten tot een bijzonder eigen geluid. Het is een geluid dat opvalt door de wat hoge vocalen, door fraai en afwisselend gitaarwerk, door een subtiel spelende ritmesectie en vooral door songs die de zon laten schijnen, maar zich er nooit makkelijk van af proberen te maken. De songs van Maggie Brown zijn in veel gevallen aanstekelijk, maar vervallen nergens in clichés. Steeds als je denkt te weten welke kant het op zal gaan, volgt er weer een wonderschone verrassing en het is er iedere keer één die razend knap in elkaar zit. Luister naar het debuut van Maggie Brown en je hoort een gelouterd klinkende band die het maken van gitaarmuziek tot kunst heeft verheven. Die kunst zie je ook terug op de buitengewoon fraaie cover van de plaat, waarop het schilderij Seestück - See-See van de Duitse kunstenaar Gerhard Richter wordt weergegeven. Het is een cover die uitstekend past bij de muziek van de Amsterdamse band. De muziek van Maggie Brown heeft veel diepte en beweging, maar van angstaanjagende golven is geen sprake. De zon schijnt, maar wolken zijn nooit ver weg. Ik zet het debuut van Maggie Brown maar weer eens op en voor de zoveelste keer word ik gegrepen door de mooie en bijzondere songs van de band. Een Amerikaanse band zou met steun van Pitchfork en een debuut van dit niveau zomaar uit kunnen groeien tot één van de sensaties van 2014. Of dat ook haalbaar is voor een band uit Amsterdam is maar de vraag, maar brede erkenning voor deze prachtige plaat zou niet meer dan terecht zijn. Ik sta zeer open voor nieuw talent en krijg veel prima’s debuten binnen, maar platen van het niveau van het debuut van Maggie Brown zijn zeer schaars. Dit is absoluut één van de beste gitaarplaten van het moment en ik heb nog lang niet alle geheimen van het debuut van Maggie Brown ontrafeld. Ga vooral zelf luisteren naar deze geweldige plaat, die vervolgens voor een vriendenprijsje in huis kan worden gehaald. Doen, of je krijgt later heel veel spijt. In the past month we have published several albums stemming from 1968-1969. This one does not fall under this series, because released in 2014. Still, The Cats were discovered by yours truly in 1968. They were even in the first Top 40 I ever saw with 'Times were when', so there you go. About a month ago I wrote a small recollection following the demise of Cees Veerman, guitarist and one of the vocalists of The Cats, the band from Volendam that scored many a hit, mainly between 1966 and 1984, before the band called it a day for a final time in 1985. Most hits after 1974 I'm not familiar with as The Cats and I parted ways some time before that already, with exception of oldie 'The end of the show' that was released to celebrate a, not definite, split. Since writing about Veerman I learned that Jan de Hont, guitarist of ZZ & de Maskers, September, Boudewijn de Groot and Bram and Freek played guitar solos for The Cats in the studio, because The Cats at the basis was a vocal group and not instrumentalists. And a three piece cd box under the title Collected was released. I decided to listen to the hit singles and found out that there are a lot of them. To recap, The Cats were a five piece: Piet en Cees Veerman, Arnold Mühren, Theo Klouwer and Jaap Schilder later added with Piet Keizer. (And no it's not the two famous Dutch soccer players among them.) 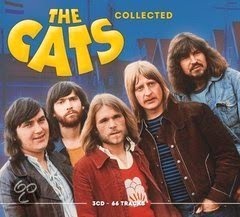 And to give you an idea of how big this band was, The Cats scored 11 golden singles, >100.000 units sold, 14 golden LPs, >50.000 units sold and has 37 Top 40 entries of which 5 reached #1. As I already wrote The Cats were big, in fact since the spring of 1968, when I discovered there was something as a chart in The Netherlands, the Veronica Top 40. 'Times were when' was in on its last legs, soon followed by The Cats's biggest hit to that date 'Lea'. There were five hits before that. I missed the first two, but do no the third one 'Sure he's a cat', a great pop song. Not unlike Cat Stevens' first two hits. It's number five that I really remember from the time, but also had sort of forgotten all about. Hearing the violin intro, I know exactly again why I liked it so much as a kid. 'Turn around and start again' has a perfect pop feel, without being a perfect song. It comes close though. A strange mix it is, between the orchestra and the fairly hard rocking backing band. The strange combination is what makes this song work. The song though that really surprised me, is 'Marian'. There are some tacky violins here that one has to get through, but 'Marian' is a perfect pop song and a totally deserved number 1 hit. That the band dared to experiment, became clear from the Spanish guitar sounds that were incorporated from 'Where have I been wrong', it's fourth number 1 hit from 1970, that followed the rather "normal' pop single 'Magical mystery morning'. One I didn't remember, but like as well. Songs following got other more exotic rhythms like 'Let's dance' or 'Be my day'. There is also a swap at rock and roll and country in 'Country woman'. The older 'Vaya con dios' that only became a hit in 1972 is almost a religious song, with a dominant female vocal harmony. Something very uncommon for The Cats. 'Vaya con dios' reminds me of 'It's the end' by another Dutch vocal group called The Buffoons. Very theatrical, loads of emotions, but also an extra. It is the only The Cats song, which does not have a clean vocal. Piet Veerman's voice breaks and that gives this softly violined song an edge that makes it different and good. 'One way wind' (1971) is something of a guilty pleasure. I just can't help liking the song. That is also just about the end of my musical relationship with The Cats. I discovered bands like Slade, T.Rex, C.C.S. (admittedly with exception of Slade just the singles) , that rocked in ways I didn't know before and The Cats, well, they did not. So no matter how long the list of hit singles, although never as big as before 1975, is, most songs have made no impression on me or I just don't know them. With that one exception the beautifully, melancholy 'The end of the show'. Summing up The Cats are just a little more then a memory of early youth. Several songs have all the elements of a guilty pleasure. A few are just plain good by themselves. It is time that I revise my early 1970s vision on the band and admit that it is a lot better than I cared to remember and can rightly be called one of the better 60s pop groups from The Netherlands. You can listen to 'Turn around and start again' here. or 'The end of the show' here. In 'Oor' I read a review stating that the debut album of EMA was the best record of that year and that it was so hard to get a grip on this new album. That made me curious. What kind of album would this be? Well, the sort of album that is an adventure. An album that shoots off in all sorts of directions. An album that throws all sorts off influences into the blender and comes out as something very diverse. From ballads to Hole-like rock. EMA is Erika M. Anderson, a U.S. singer, originally from South Dakota. Following 'Little sketches on tape' (2010) and 'Past life martyred saints (2011), The future's void is EMA's third album. Having missed both previous efforts, it is possible for me to listen to The future's void like a tabula rasa as far as EMA is concerned. The future's void is not your average album. To write that it has some theatrics and antics in it is something of an understatement. Like writing that Cristiano Ronaldo's recent way of celebrating a goal is completely normal behaviour. The first distinctive feature of this album is that no matter what is going on, there is background noise for most of the time. Droning electric sounds fill the holes in the mix. Sometimes in the background, sometimes the backbone of the song. The second feature is that The future's void balances on a thin line between rock and dance. From both come elements that create the sound of EMA. It is also the reason that my appreciation of The future's void can go any way depending on my mood. 'Neuromancer' is such a song. The song is built from rhythms, strange rhythms as well. While EMA takes quite a rock stance in the singing. As if the vocal melody comes from a totally different song. Opening song 'Satellites' is sort of the same, but as a song opening the album it overwhelms. The strong voice, bare or treated, all the powerful noises coming from everywhere make for a potent mix, leaving the listener behind sort of breathless. Sounds bringing to mind music I listened to a long time ago, without being able to pinpoint the typical piano playing. In 'So blonde' EMA is totally a rock chick, shouting like Courtney Love 16-20 years ago. A song to instantly like. 'When she comes' is the soft version of Hole. An acoustic guitar, bas, drums and droning noise in the background. Singing with a soft voice, loads of harmonies. Man, do I love this song. By then it is clear to me that EMA has several faces and is willing to show them all. That makes The future's void an as uncatchable as unpredictable album. A piano ballad with some chamber orchestra strings? There's '100 years' for you. When listening to this album for the first few times is like riding a roller coaster in the dark. There's no predicting what's up next. Sort of impressive while holding on tightly as a result of anxiety. Taking The future's void all in, it is hard to really form an impression of the album. What speaks for it is the voice of EMA. Sort of supple, with several tones and heights within its reach. What speaks for it is the adventure that the listener is taken on. Against is that I just don't like the approach taken in some songs. Too moody, drony, dancey, whatever. EMA does not let herself be caught out by limitations, restrictions or conventions and that in the end wins me over and made me listen to The future's voice more often, despite my reservations. An album that is slowly growing on me and will probably remain to do so over the coming months. You can listen to 'Satellites' here. A while back we started a series on albums released in 1968-1969 for a specific reason that was described in the first publication on 'Spooky Two'. Since, there followed several posts including Chicago, Blood, Sweat & Tears and others. Joe Cocker's debut album is the next in line. 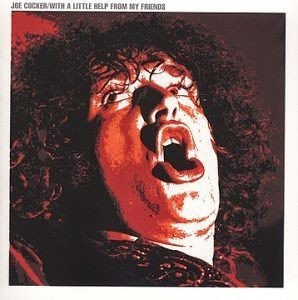 Joe Cocker was one of the artists that featured in the Top 40 in autumn 1968, with his blown up version of The Beatles' 'With a little help from my friends'. I wasn't aware of the original, so for me this was a Joe Cocker song. I got to know the song even better through the Taiwanese copy of 'Woodstock' a friend had, on which there is an 8 minute plus version of 'With a little help to my friends', that goes totally over the top in the last three minutes. Up to today I have never listened to this album. Simply because it never happened and I never really became a fan of Joe Cocker. When we get down to it, Cocker is a cover artist with a hell of a voice and musicians and producers around him that allow him to have a career that is coming close to spanning 50 years. John Robert Cocker was born in 1944 and recently turned 70. Having played in a few bands since the age of 16, he did not become a successful recording artist until the release of the famous The Beatles cover in 1968. The sort of cover that eclipses the original and never lets the original shine again. The set up of With a little help from my friends is a blueprint for all Cocker's album that followed. Covers of hit records of days past and a few originals, co-written with in this case his band leader Chris Stainton. Having never heard or seen the record sleeve, I was surprised how many well-known artist collaborate on this album from at that time a fairly obscure British singer. Tony Visconti, Henry McCullough, Steve Winwood, Albert Lee, Matthew Fisher, B.J. Wilson. And best of all: Jimmy Page, should you be wondering who's playing that great guitar riff in the hitsingle. Players doing a session, that is all. The songs vary from Bob Dylan's 'Just like a woman' and 'I shall be released'. The umpteenth version of 'Don't let me be misunderstood' and Traffic's 'Feeling alright'. Next to that there are three originals, that are not necessarily lesser songs in quality than the covers, so that's a compliment. Most songs sound familiar, but do not really add to my experience with the originals. Except for that one song. As I wrote I never really warmed to Joe Cocker. Yes, I like 'Cry me a river' and 'High time we went' a lot, 'Delta lady' comes close. The reggae of 'Sheffield steel' appealed to me for a while, but it took to 198something before Cocker really made an impression on me again. 'When the night comes' is, as far as I'm concerned, his other total classic song. With a little help from my friend is a decent album, but I will not warm to it. I like the organ-piano sound of the singing. Joe Cocker's voice remains special. To think he was something like 23 when they recorded this set of songs. His voice is like a centenarian blues shouter's in great health. The album cover though is great. Cocker is just wild here. The music is good, not special. Except for that one song. Just because of this song, 'With a little help from my friends', Joe Cocker will know eternal fame. With a little help from his friends, who made the song this great. The guitar riff, the organ, the dynamics, the bass guitar's runs, the backing vocals and over all this this rasp of voice, with so much power and despair in it. There's only one singer in (t)his league: The Shoes' Theo van Es. No one else gets close. You can listen to 'With a little help from my friends' here.